When you run a business, you need the basics, pens, notebooks, computers, desks and other essentials. Do you realize the importance of mailroom equipment and packaging supplies? 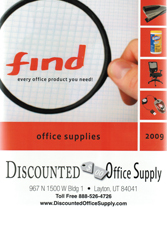 Discounted Office Supply.com remembered. That’s why we have such an extensive list of packing supplies-letter openers, carts and totes, stretch film-as well as mailroom supplies such as mail sorters, stamp affixers and other equipment. In addition to our extensive inventory of supplies, we pride ourselves in having the best prices and best customer service in the industry. Whatever type of packing supplies or mailroom supplies you need, you’ll find them in one of the categories below.